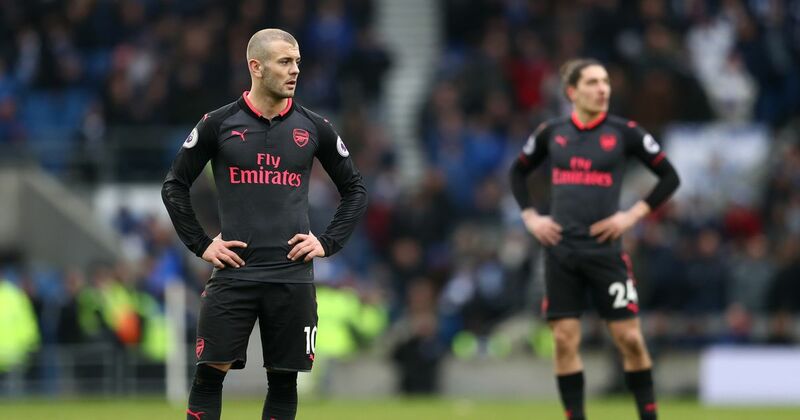 Jack Wilshere has urged Arsenal fans to "stick with us" in an apology issued by the midfielder following the loss to Brighton. Arsenal suffered their third straight loss in the Premier League on Sunday when they were beaten 2-1 by Brighton - which was also the Gunners' fourth defeat in a row in all competitions, which included the Carabao Cup final. Arsene Wenger's side now sit in sixth place in the Premier League standings, 13 points off fourth-placed Tottenham, which the Arsenal boss admitted meant the club must now focus on winning the Europa League to have a chance of playing Champions League football next season. Chants of "We want Wenger out" could be heard from the travelling Arsenal fans in Brighton on Sunday, with Laurent Koscielny afterwards urging fans to get behind the team - something which Wilshere has now also done. Writing on Twitter, Wilshere said: "I'm sorry to the gooners out there. You deserve better. Thats sic all i have to say.